“Show”: As a result of the dilatation of the cervix, the operculum, which formed the cervical plug during pregnancy is lost. The women may see a blood stained mucoid discharge hours before, or within a few hour after labour starts. Vaginal Examination – offered 4 hourly to see progress of cervical dilatation. Remember During 1st stage, 1-1.5cm cervical dilatation should take ~1hour for nulliparous women. This is quicker for multiparous women. Induction of Labour As a general principle, induction of labour is undertaken when continuing a pregnancy is associated with greater level of maternal or foetal risk than delivery. 20% of all pregnancies are induced. The Bishops score helps assess the favourability for induction of labour. Instrumental Vaginal Delivery Labour is divided into 3 stages. Stage 2 of labour (the stage from full cervical dilatation to the expulsion of the baby from the uterus) sometimes can be difficult and prolonged. Instrumental vaginal delivery helps with this stage and reduced need for caesarean section which is associated with more complications. Remember Postnatal care following instrumental vaginal birth requires attention to analgesia, voiding function, thromboembolic prophylaxis, rehabilitation of the pelvic floor, and counselling regarding the index birth and future births. Overview Episiotomy is a surgically planed cut to enlarge the vaginal introitus so as to facilitate easy and safe delivery of the foetus. Overview Failure to progress also known as labour arrest, labour dystocia or abnormal labour is used to describe a labour pattern deviating from the observed (normal) in the majority of women who have a spontaneous vaginal delivery. About 20% of all labors ending in a live birth involve failure to progress. Bandl’s Ring An hourglass constriction ring of the uterus. Complication associated with obstructed labor in the second stage. The constriction forms between the upper contractile portion of the uterus and the lower uterine segment. Labour pattern deviating from the above normal labour parameters is considered abnormal labour or failure to progress. Other interventions are indicated such as instrumental delivery or most often caesarean section. Overview Caesarian delivery is the surgical removal of the infant from the uterus through an incision made in the abdominal wall and an incision made in the uterus. Incidence is 15-30%. Caesarean sections can be done as a planned procedure (elective) or as an emergency. 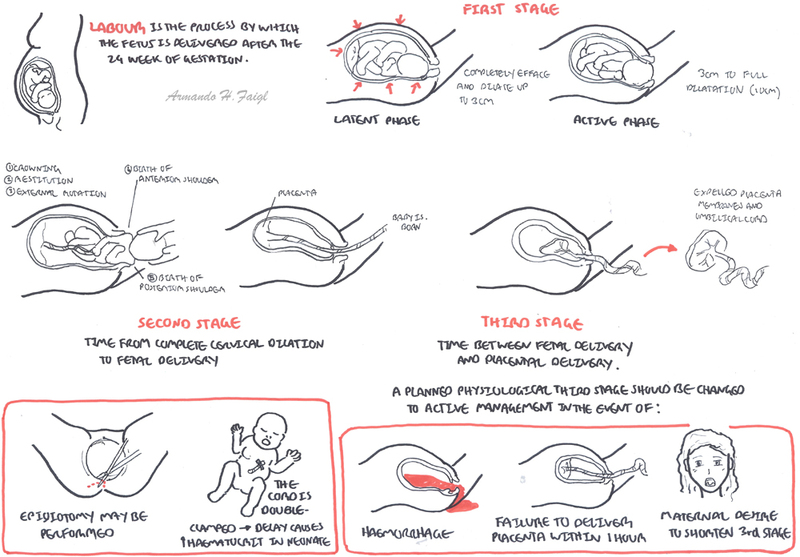 Overview Occipitoposterior Position (OP) is the most common foetal malposition. Before labour, 15-20% of term foetuses in cephalic presentation are OP, but only 5% at vaginal delivery remain OP because most spontaneously rotate to Occipitoanterior position during labour. Remember The most common foetal position is left or right anteriorposterior position, cephalic presentation. Side note Doctor can attempt manual rotate OP at 36 weeks or 37-38 weeks to a AP. Breech Presentation: When the buttocks, foot or feet are presenting instead of the head in a longitudinal lie. Overview Uterine rupture occurs in 2 per 10,000 of all pregnancies. It is a rare but significant event. It may occur before or after birth and can vary in size. Overview Uterine inversion occurs when the uterine fundus inverts within the endometrial cavity. 1 in every 2,500 births. Overview Umbilical cord prolapse is a true obstetric emergency requiring immediate delivery. It is when the umbilical cord descends through the cervix alongside or past the presenting fetal part in the presence of ruptured membranes. If the cord is compressed, the foetus will die within 5-10 mins. Cord Prolapse: The umbilical cord lies in front of or beside the presenting part in the presence of ruptured membranes. Cord Presentation: The presence of the umbilical cord between the presenting part and the cervix. Aetiology Mechanism of Foetal Death is from compression of the umbilical vessels by the presenting part and/or umbilical arterial vasospasm due to exposure of cord → acutely compromised foetal circulation→ foetal death or neurological sequelae unless immediate delivery. Recognise and call for help! Remember Paediatrician or neonatologist needs to be present. Remember paired cord blood samples of pH and base excess! Shoulder Dystocia: Inability of the fetal shoulders to deliver spontaneously, usually due to the impaction of the anterior shoulder behind the maternal symphysis pubis. McRobert’s Manoeuvre: The maternal thighs are sharply flexed against the maternal abdomen to straighten the sacrum relative to the lumbar spine and rotate the symphysis pubis anteriorly toward the maternal head. Suprapubic pressure: The operator’s hand is used to push on the suprapubic region in a downward or lateral direction in an effort to push the fetal shoulder into an oblique plane and from behind the symphysis pubis. Erb Palsy: A brachial plexus injury involving the C5-C6 nerve roots, which may result from the downward traction of the anterior shoulder; the baby usually has weakness of the deltoid and infraspinatus muscles as well as the flexor muscles of the forearm. The arm often hangs limply by the side and is internally rotated. Remember The biggest risk factor for shoulder dystocia is fetal macrosomia, particularly in a woman who has gestational diabetes. Remember The most common injury to the neonate in a shoulder dystocia is brachial plexus injury, such as Erb palsy. Overview Amniotic fluid embolism is a rare and potentially catastrophic, but poorly understood condition that is unique to pregnancy. It may range from a relatively minor subclinical episode through to one which is rapidly fatal. Diagnosis The diagnosis of AFE is a clinical one, based on the presence of cardiovascular and respiratory compromise and coagulopathy after the exclusion of other causes. Overview Invasive implantation increases following caesarean section and is incrementally linked to the number of caesarean sections the woman has had. Placenta accreta: Abnormal adherence of the placenta to the uterine wall due to an abnormality of the decidua basalis layer of the uterus. The placental villi are attached to the myometrium. Placenta increta: The abnormally implanted placenta penetrates into the myometrium. Placenta percreta: The abnormally implanted placenta penetrates entirely through the myometrium to the serosa. Often invasion into the bladder is noted. The usual management of placenta accreta (abnormal adherence of the placenta to the uterus) is hysterectomy. Postpartum Haemorrhage: a blood loss exceeding 500ml after delivery of the infant or any amout of blood loss postpartum that causes haemodynamic compromise in the women. Trauma – Lacerations of the genital tract (6%) – Trauma-related bleeding can be due to lacerations, surgical incisions, or uterine rupture. Remember Significant haemorrhage can occur rapidly as maternal blood circulates through uterus at 500-800mL/min and 2/3 cases of PPH cannot be predicted. Side note Consider uterine rupture as trauma. There can be signs of shock with not visible blood loss. There is abdominal tenderness, shoulder tip pain. Overview The diagnosis of preterm labour is generally based upon clinical criteria of regular, painful uterine contractions accompanied by cervical dilation and/or effacement between 24-27 weeks. Infection is a cause of preterm labour – could antibiotics against bacterial vaginosis have a role? 33% of PPROM associated with infection – do investigations!